If you use a company laptop for personal use, does it give you the right to do with it as you please? A client of mine experienced this issue a few weeks ago. He has small office and is very generous with his employees. All employees with laptops use the laptop not only for business use but personal use too. When an employee leaves, their company laptop has always been returned as is. All company user data is typically left on the laptop, including emails, for the next person to use. This provides a base of current projects, documentation and history for the new employee. In some cases, we format the unit and provide a clean system. Several weeks ago an employee left and returned their laptop thoroughly wiped out. We were unable to restore any of the data. The former employee purposely removed all the data in a way that it was not recoverable. In my eyes, this is theft. I understand why the employee formatted the hard drive; his personal data was also on the system, including correspondence with his new employer. It is easier and more efficient to erase the hard drive than to pick through it and remove all personal traces. As a small business owner, you should have policies in place concerning acceptable personal use of company equipment. The policy should also include the condition the company devices are to be returned. Does your company have a personal use policy in place? Normally I post a tech tip for the small business owner, but this week I will be changing the content. Please feel free to return next week for another tech tip if this of no interest. A dear friend of mine has started chemo for bladder cancer. One of procedures after the two days of chemo is flushing the body by injecting saline solution. One of the side effects of having this much fluid (5 litres in 4 days) pushed into her body is water retention. She found it difficult to wear anything that could accommodate the “girth” and asked me to “whip up” a wrap skirt for her. I have been sewing as a hobby for the last 10 years. I am in no way an expert or very talented, but I can sew a straight line (most of the time). When she asked me to make this, I thought this would be an easy little project. How hard could it be? I had never made a wrap skirt and Googled it. I found how to make a basic wrap skirt, but I could not find any ideas or instructions to create one with my friends’ unique requirements. I hope my experience and design can help someone else. 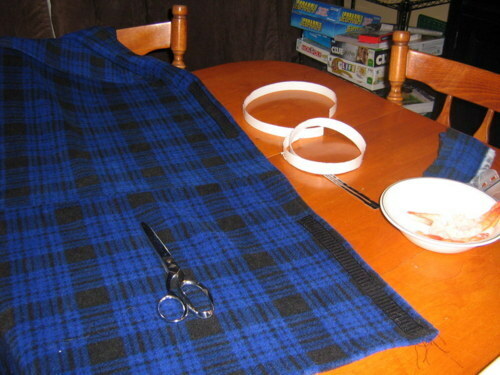 She had asked for the skirt to be fleece, floor length, wrap around twice and fasten with Velcro. She is approximately 5’2” and currently weighs 117 pounds, but when injected with the additional fluid, her weight increases to 130 pounds. 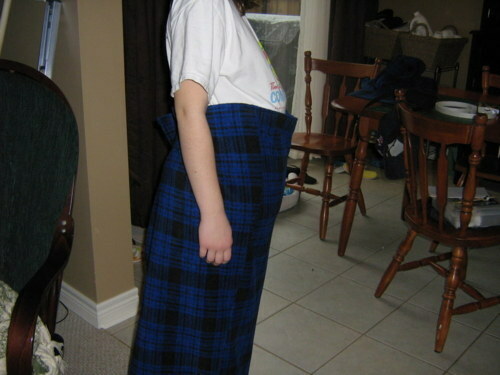 The skirt had to accommodate for this “growth” around the middle. To make this even more challenging, she lives in a different city, and I was unable to fit the skirt for her as I went. 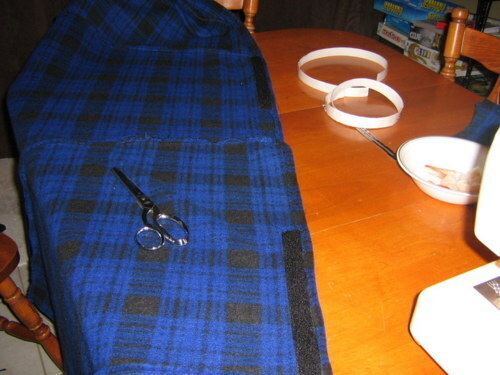 Here are the instructions for the skirt. First I followed the instructions for wrap skirt from this forum http://www.craftster.org/forum/index.php?topic=14880 see reply number 3. I made 4 Trapezoids and sewed them together to form a rectangle which measured 70” x 37”. I then hemmed the 2 shorter edges. I Zigzagged the top then folded over ¾” and stitched in place. Using myself as the model, I determined I would have to add Velcro to the beginning of the wrap. I needed to add this peice of Velcro on the inside othewise the skirt would slip because the double wrap around. I sewed a 6” piece of Velcro to one edge of the skirt then aligned the matching Velcro piece allowing the pieces overlapped on the first wrap. The 6” allows for adjustment either way. Once the first wrap locked in place I then determined where the second Velcro placement would be and again used a 6” piece to allow for adjustment. A picture or two are worth a thousand words. I hope the pictures will help clarify the placement of the Velcro. A picture of the completed skirt modeled by my daughter. She is about 20 pounds and 2 inches shorter, but you get the idea. I had her put a folded towel under shirt to simulate some weight. Overall I am very happy with the final product. I met all the requirements my friend asked for, floor length, warm fleece and Velcro for fastening. The skirt only took a few hours to make and was easy. She suggested one alternation; use one longer strip of Velcro going from end to middle. Next time I would not choose a plaid pattern. I matched the pieces to the plaid but forgot the trapezoid pieces had to rotate which caused the stripe mis-alignment. I do not think my friend will mind. When I make another in the spring, I’ll choose a different fabric pattern. I even had enough fabric to make a matching hat and shoulder wrap. This is a perfect example of how NOT to treat your customer base, and worse how to exclude your company from future sales. An explanation about the device and the market is required before continuing. The equipment is an expensive “medical” device used for training, teaching and consultations. It is part of an emerging technology, but more players are entering the market every year. MFG has been the world market leader for several years, but other companies have started making strong inroads into this field and market share. There is a handful of players using this technology and only a few manufactures, but both are growing very quickly. It is a small, international community and word travels fast among users and manufactures. CA uses this device to help train future technicians and expose them to the new technology. All future technicians from this facility have used the MFG product. About 6 months ago the equipment started failing. CA called MFG for help. CA is tight on funds (due to the nature of their funding model). MFG said they could attempt to diagnose the problem remotely, but CA would have to agree to their price. CA felt the cost for this service was extremely high (I agree), since there is no guarantee the problem would be found. The session could be made remotely, over the Internet; no one would have to make a trip to the site. The entire session would probably last 30-60 minutes. I even offered to be on-site for free if needed. If the problem could be found, CA could then make a decision about a repair based on cost, time etc. This is a specialized piece of equipment that only MFG can diagnose and repair. Currently CA is extremely upset and angry over the situation. Worse, CA is expressing their frustrations to that very small niche community they belong too. MFG has an opportunity to keep a past customer happy and turn them into a current customer again. Even more significant, MFG is turning away potential future clients because the users of the CA device will no longer be using and loving it. CA will now have to outsource their needs, and use a different device. CA is already looking at other manufactures to replace this equipment, because of the lack of customer service from MFG. The kicker; one of the ways CA is planning to fund this new equipment, sell the MFG device to the competition, to be reverse engineered. Please do not misunderstand me; I am a firm believer in paying for services, as long as the fee is reasonable and just. MFG should have stepped up to the plate and offered to diagnose the issue at no cost, to salvage their deteriorating relationship with CA. This would have satisfied CA, even if the unit could not be fixed. More importantly, CA would be spreading the word that MFG did try to help. Is saving your company brand not worth an hour of your time? A 10 year old company specializing in custom medical devices sold worldwide. At the time of this writing, the company had 10 full time employees. Five employees worked in the office on desktop systems connected to a hub and router. The other five employees were outside sales reps all using company laptops. Two of the sales reps came into the office weekly. Two would be in the office a few times a month. The fifth lives in another province and is only in the office once a year. The office has a business Internet connection. The connection was and still is a satellite and is prone to disruption. Satellite is the only cost effective and viable option at this point in time. Fibre will be available in the area in a few years. The office was hard wired with Cat 5 cable and two access points available for wireless connectivity. Users had individual copies of pricing spreadsheets and quotes. When a user needed a file, the file was either emailed or copied across the network to a shared folder on the users’ desktop system. A desktop computer served the CRM then shared via the network to the other users in the office. A convoluted backup solution was in place. The backup solution was never tested. This was discovered after a hard drive failed and we were unable to successfully restore the users’ data. Also, installed was one network printer, one NAS (network area storage) and a standalone fax machine. The client requested we keep costs to a minimum to remain within their budget. They did not require or want a large, complicated system and do not have the staff or resources to manage it after implementation. We installed a server operating system on a spare computer. This computer met the minimum requirements but had limited disk space. I expected this solution to meet their needs for 18-24 months. This was 3 years ago, and we are only now looking at upgrading, due to hard disk space limitations. The server houses all the shared files and the CRM which all users can access depending on their permissions. All sales reps have an offline CRM database on their laptops which they update daily and then sync with the office. Critical files on the server (in this case financial files) are backed up to an USB key daily and rotated off site. All additional server files are automatically backed up to an external drive daily. Weekly backups are moved off site. Desktop systems have native OS backup software installed. These backups are kept on a NAS. Weekly, a staff member manually moves the backups to an external hard disk and keeps it off site. This requires a few hours, but can be done in the background. Once the office has a faster, more robust Internet connection, cloud bases backups will replace the current in-house solution. Until then, the current implementation is working well, and most importantly, when files had to be restored we were able to do so. All users with laptops are responsible for their own backups on an USB drive. Email and website hosting are outsourced. We choose this option due to connectivity issues at the local site. It would have also added additional costs to host internally in both hardware and administration. User can access files and the CRM database via a VPN connection. The server software controls the remote access permissions. Each employee has an account and permission to various files and/or options. A networked printer and a networked multifunction device have since been added. The stand alone fax was removed. In addition, an unused Windows XP system became a FTP server. The internal users can add non critical or non-confidential files to the FTP site for clients or other outside sales reps to access. Clients and outside staff can only download from the FTP server. Uploading is strictly controlled. In order to keep the costs down, older equipment was re-purposed where possible. Printers and a new fax machine had already been budgeted. Total cost less than $1000 for the server operating system. The users are very satisfied with the current implementation. As stated above, the hard disk space on the server is running low and we are in the process of adding additional hard disk storage to the server. We have looked into upgrading the current satellite Internet connection, but due to location of the office it is cost prohibitive. We will re-evaluate the connectivity issues in a few years when fibre will be available in the area. I suspect, within the next couple of years, the company may have move to a larger location in town as they keep growing. If a move or the employee growth trend continues, it would then be an opportune time to re-evaluate their needs. If and when this occurs a new server with an upgraded operating system and a more comprehensive backup plan would be added. This outlines the basics of a typical small business office and what can and needs to be done to meet the needs of the users. As you can see from the above example we worked within a limited budget and provided the functionality they required. PS Since this was originally written some of those expected growth changes are planned this year. I’ll do a follow up post as this company moves forward.